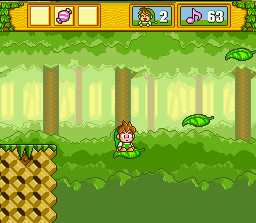 DoReMi Fantasy is a highly polished side-scrolling platformer. There are 8 worlds each with their own theme. In each world there’s a minimum of 6 levels followed by a boss. An overhead map allows you to backtrack. The levels aren’t particularly long but they possess plenty of detail, quirky enemies, excellent backdrops, ace set pieces and ultra smooth gameplay. 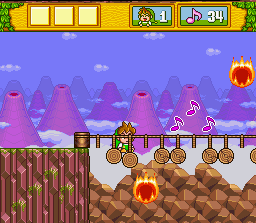 The game’s sound is also noteworthy — it occasionally foregoes music for ambient sound effects instead. It all helps to create a unique world well worth exploring and spending a weekend or two with. Milon is a great character, full of charm and animated brilliantly. Graphics are outstanding. The game has a real sense of life to it. You really have to see it in motion to fully appreciate it. Milon can take up to 3 hits. His suit starts out green, then turns blue when hit and finally red. Jumping on an enemy’s head will only stun them. To kill them, you have to first encase them in a bubble and then pop them. It’s a slight twist on the ole hop ‘n bop routine that works well. Although it’s nothing groundbreaking by any means, this slight deviation from the norm is welcomed. 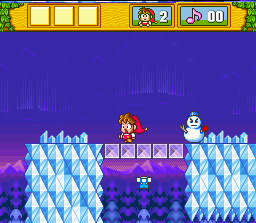 From world 2 on, each level contains a Musical Star you must find and grab (usually not that hard, but later on becomes trickier). 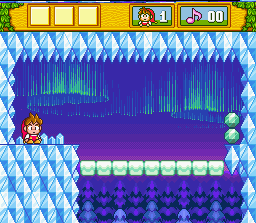 Therefore, you’re forced to explore the beautiful layouts (if you finish a stage without getting the star, you can’t battle the boss). Speaking of worlds, let’s take a look at them. It’s the ole standard forest theme world. Although basic, it manages to pull you into its charming world. 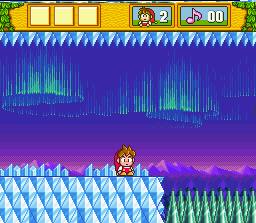 Something about SNES visuals that just does it for me. Sure, there might be better out there (i.e. Neo Geo) but visuals like this get me every single time. 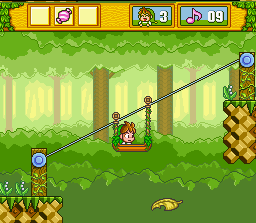 As with any platformer, the first world is simple and will get you acquainted to the game’s mechanics and control. You may feel a bit uninspired initially but it gets much better. Highlights of this world include a log ride, falling leaves over a pit where you must time your leap from one leaf to the next, and a neat little haunted cabin featuring Pinocchio-esque dolls. 2. FOOD CONSTELLATION TYPE WORLD? If the first world seemed a bit ho-hum to you, then the second world is a lot more likely to catch your eye. It’s not often that you find a themed world consisting of food and drink items combined with a very atmosphere celestial backdrop. It’s almost like some weird acid trip. Lots of neat graphical touches, a surreal and ambient soundtrack and some bizarre-o enemies make these levels particularly memorable. 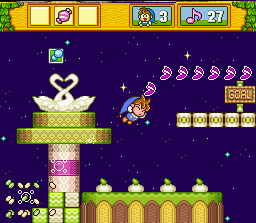 Launching posts propel Milon high through the air and usually sends the little guy bursting through blocks in the process. And it feels as awesome as it looks. 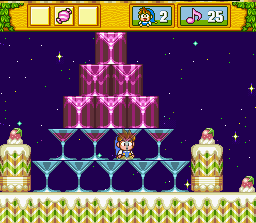 Another impressive set piece, if you leave Milon idle for a while, he’ll pull his pointy wizard’s hat over his head as the wine comes pouring down over him. It’s a cute, charming moment that brought a smile to my face the very first time I saw it. Moments like this bring DoReMi Fantasy to life. Some creepy music here! It’s not what you expect, and caught me off guard when I first heard it. It gives this stage a rather eerie, empty feel. 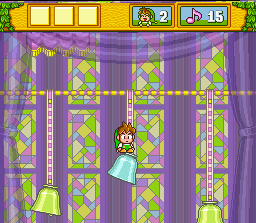 Highlights of this world include a bell hopping stage and a unique level where on/off switches litter the floor. Touch any off switch and darkness devours the scene, except for the color of the switches and Milon’s white pupils. 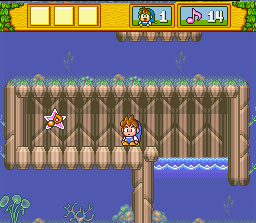 Though much of this level is on land, there are plenty of underwater sequences. I quickly developed a burning hatred for those annoying spear throwing frogmen. And I suspect you will too. I love this world. 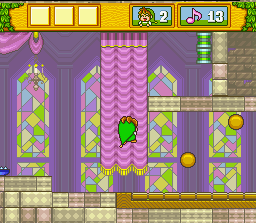 It features some of the game’s best looking visuals and stages. It’s incredibly fun to play through. Stage 5-3 is a sled stage that particularly rocks. Love playing this at night! C’mon you knew this was coming! 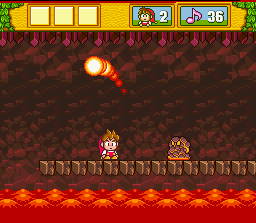 No 16-bit platformer is complete without the ole mandatory fiery-themed level. I don’t mind tropes so long as they’re done well. And Hudson doesn’t fail to deliver here. 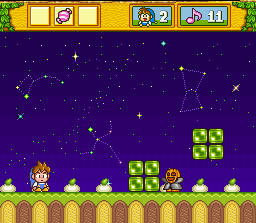 Two fairly difficult force-scrolling levels are spread across this blazing world. 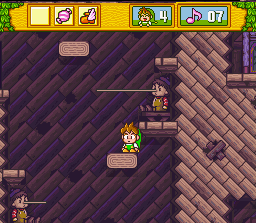 OK, so DoReMi Fantasy fulfills all the platforming tropes. When it’s this well done though, who cares? Certainly not me. The toy stages are stunning. The richness of colors immediately jumps out, radiating off your TV screen. It’s a reminder that 16-bit visuals, when done right, has an undeniable charm that hits all the right notes [I see what you did there… DoReMi Fantasy… notes… har har… -Ed.]. In addition to some gnarly visuals, there are plenty of dangerous little gadgets in this toy world from hell. Black Friday ain’t got nothing on this. There’s also a haunted house-inspired world. But I’ll save some for you to imagine, or better yet, experience it yourself! 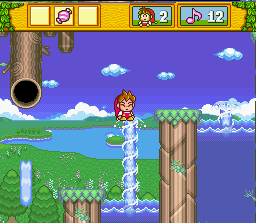 If you haven’t played this yet and you consider yourself a fan of the 16-bit era platformer, this is a must play. 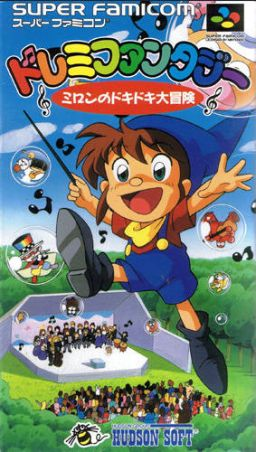 It’s one of the best Super Famicom-only games ever released, and I wouldn’t hesitate to say it could be the best non-Mario platformer on the entire system. Yes, I believe it’s that damn good. 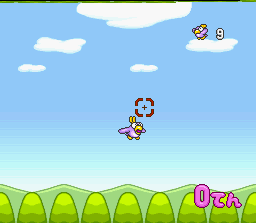 Different power-ups are available and hidden inside breakable items. 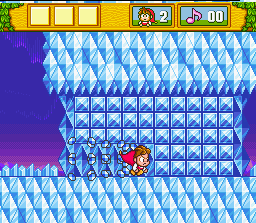 Power-ups include floating shoes, double bubble, bubble gum (very handy should you fall in a bottomless pit), and so forth. 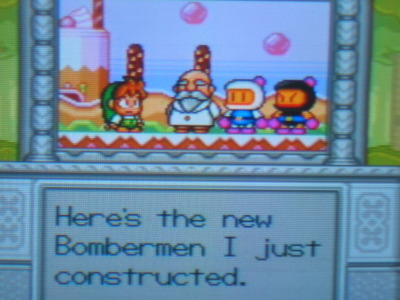 A fan translation (as seen above) was released in August of 2007. Like I said earlier, you can enjoy the game without the translation as there isn’t much text, but it’s sure nice to get the whole package. 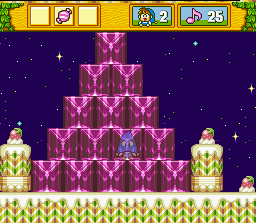 DoReMi Fantasy is an excellent platformer every serious SNES fan should own. It’s a shame it didn’t receive a domestic release. But seeing as how it came out March 1996 (the SNES was practically dead in the US by then), it’s hard to harp on that much. 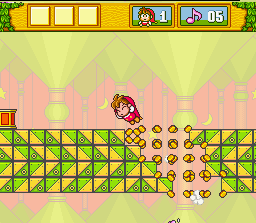 Personally, I think DoReMi Fantasy ranks right up there as one of Super Nintendo’s finest platformers. It’s terrific from top to bottom, and as a friend of mine once put it perfectly: “It’s about as charming as a video game can be.” I couldn’t agree more. Happy 20th anniversary, DoReMi Fantasy! 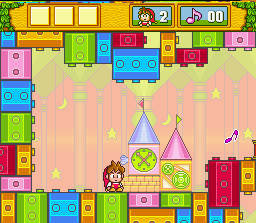 I love DoReMi Fantasy so much; it’s not only a HUGE improvement over its 8-bit predecessor Milon’s Secret Castle, but it’s also one of the best Nintendo 16-bit games ever made bar none! I first played it in 2008 on the Nintendo Wii Virtual Console, and it was the first Super Famicom I ever played. I enjoyed it so much that I browsed the internet to find out more about it and SFC, and that’s how I found out about your site. =) Your SFC mini-reviews were a joy to read, and many of them made me so curious and intrigued that I wanted to explore more games from Japan myself… but it wouldn’t be until I got a Retro Duo and eventually a Super Famiconsole that I would experience lots of SFC goodness. Your site inspired me to import, and I’m glad I stumbled upon it almost eight years ago. Hey StarBoy, good to hear from you again. Yes, I appreciate the love you’ve shown to me over the years on my site and also on yours (I see that you’ve referenced to RVG a few times on your own site).